Calgary, Alta. 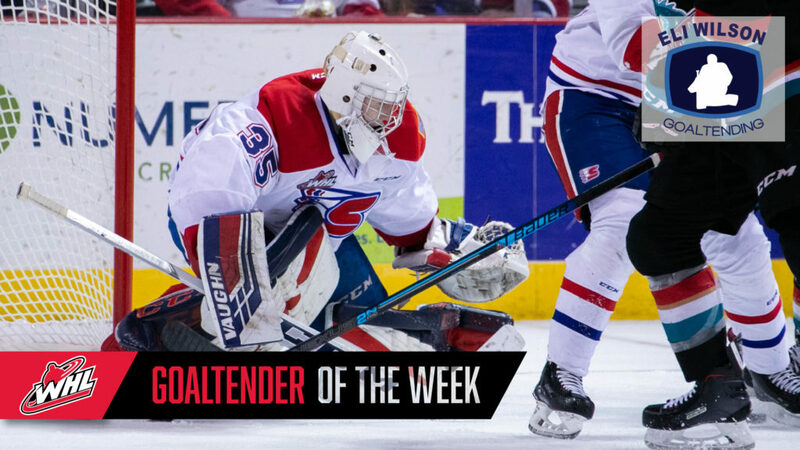 – The Western Hockey League announced today that Reece Klassen of the Spokane Chiefs has been named the WHL Goaltender of the Week for the week ending February 3, 2019. Klassen recorded his first career WHL shutout on Friday night against the Kelowna Rockets and added another nine saves the following night at Portland, finishing the weekend 34-for-35 through 85:00 between the pipes. The Cloverdale, BC native came off the bench Saturday night at Portland to take over for Bailey Brkin at the start of the third period and was 9-of-10 before holding the Winterhawks scoreless through the five minute overtime. The strong weekend is only the latest installment in what’s been a bit of a career revival for Klassen since being acquired by Spokane from the Lethbridge Hurricanes on January 2, 2019. In five games since joining the Chiefs, he’s yet to allow more than three goals in appearance and Spokane has picked up at least one point in the standings in four of those games. Originally joining Lethbridge as a listed player during the 2017-18 season, Klassen has appeared in 54career WHL regular season games, posting an 18-13-7-5 record, a 3.40 GAA and a 0.893 SAV%. Klassen also appeared in one game for the Hurricanes during their 2018 WHL Playoffs matchup with Red Deer. The Chiefs return to Spokane Arena on Friday, February 8 to host the Victoria Royals on Washington’s Lottery Night. The first 1,000 fans through the gates will receive roll-a-banners courtesy of Washington’s Lottery. Then, the Chiefs will host the Kootenay ICE on Saturday, Feb. 9 for Centennial Hotel Buck Night, with $1 hot dogs and Coca-Cola products all night long. Tickets for all Chiefs home games are available online, over the phone at 509-535-PUCK and in-person at the Chiefs’ Ticket Office.